After many years of careful ownership – really – I’m selling up my main scan rig. They’ve not seen any gigs in the last couple of years and various changes in my lifestyle mean that they are unlikely to, so here they are for sale. There are 12 in all, and 2 large, wheeled flight cases with lots of handles, good casters, caster brakes etc. I’m happy to sell Roboscans separately, but the whole lot has to go so the more you buy, the better the deal. I’m looking for £69 a scan, or £350 for six with a flight-case. 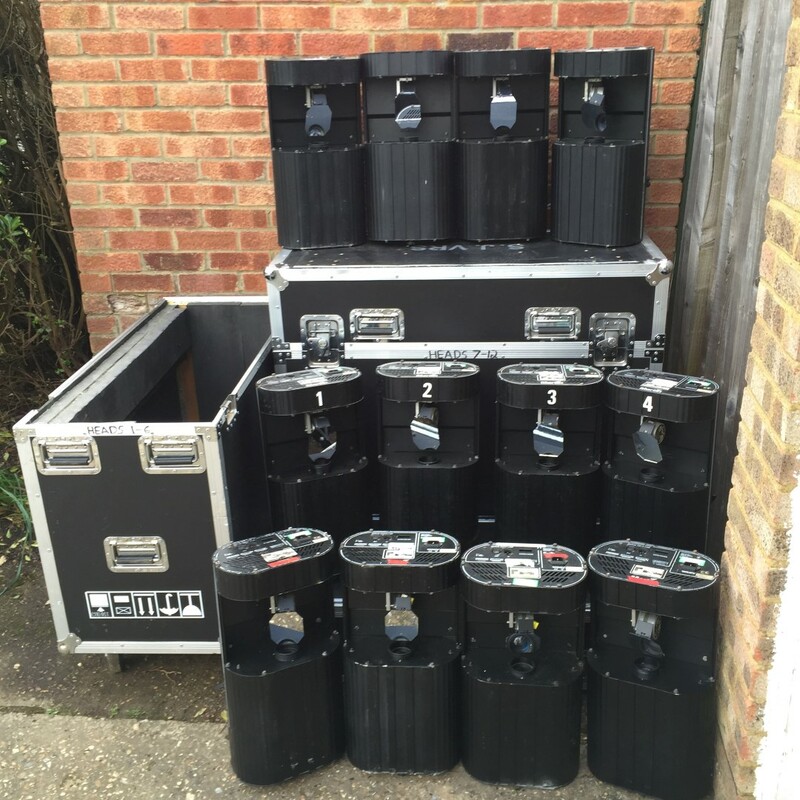 Or £600 for all 12 with both flight cases. There’s also a big plastic tub full of spare parts that I’ll chuck in when the final unit sells. All mirrors are in good condition with no cracks. All units have working bulbs, and come with a mains lead. They do not come with DMX leads or controllers. All motor functions work: pan/tilt, colour wheel, gobo wheel, rotating gobos and effects wheel. The last time I used these, everything worked on all of them. The units are of course old and used and their condition reflects this. They are sold as seen, with no returns, but I’ll be happy to go through and test them with you when you come to collect them. Update: 6 scans and a case sold today. The remaining 6 are still available at £69 each, or at £350 for all six in the remaining flight case. There’s also a big plastic tub full of spare parts that I’ll chuck in when the final unit sells. Update: all 12 scans have now been sold.I wish their new owners all the best!